I'm not perfect. Never claimed to be. OK, maybe once in a while I talk about how the world would run smoother if I was in charge. I do, however, take great pride in my job and my abilities. I'm a communicator - in charge of outside communication efforts from the organizations I represent. Much of my time is spent writing, editing, proofreading and proofreading some more. I admit that I tsk-tsk the MAJOR typos (a misspelled word or mistake in spacing is going to happen) that I read on the Web, in newspapers, magazines and books. I glanced over at a publication that I write, edit AND proofread and there it was this morning staring boldly back at me. Oh well, it was bound to happen one day. But why couldn't it have been on page 2 or 3 or 31! Whenever I have an electronic device in my hand, my nephews find me. If they see my smartphone, they put out their grubby little hands and look at me with those oh-so-sweet eyes. I do what any aunt would do...hand it over after turning off the phone function! As for my camera, they are always cheesing in front of it (note the photo above of G-man) and then wanting to see the photos I take. Recently, they've taken to my love of photography and wanted behind the camera - or they are just sick of having a camera in their faces all the time. During our marathon sweet corn freezing, I was sitting on the kitchen for trying to get some shots from a different angle when it happened. 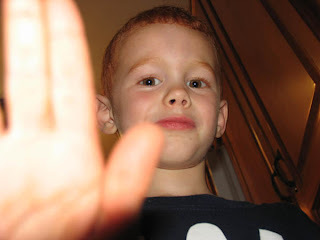 I got attacked from both sides by nephews wanting my camera. I won't say that they are budding photographers but they definitely show the world from their perspective! Her exact words as the boys were taking this photo were "I don't want to end up on Aunt Mi-Mi's blog." Too bad! 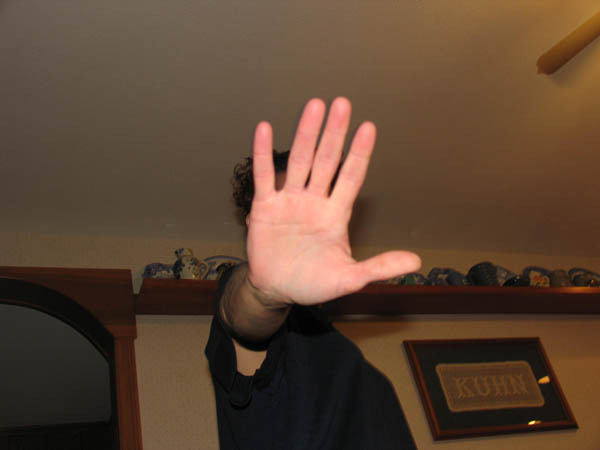 All I can think of when I see this one is "Talk to the hand..."
G-man had to re-create his mom's pose. I was sitting in my car outside of CVS today when it happened. I was quickly checking my receipt to make sure it was correct (not a lot of great deals this week, but I got a couple). I glanced over as the car next to me was backing up and noticed a set of keys hanging out of the lock in the passenger side door. I quickly got the attention of the driver and she stopped. I hopped out of my car; ran over to hers; and pulled the keys out of the door. As I handed them through the window, the driver started to smile and said that she had searched all over for them and thought for sure they had to be in her car! I said it happens to all of us and we shared a laugh. It was a small thing. The keys probably would have stayed in the lock until she made it home. But if it was me, I would have worried all the way home where the keys could be so I'm glad that I saw them. Have you ever done some small act of kindness that brightened your day as well as improved someone else's? 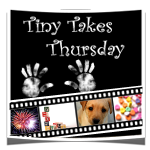 This is my first attempt at Five Question Friday over at My Little Life. 2. What's the best compliment you ever received? That I'm a good daugher/granddaughter. 3. Do you buy cheap or expensive toilet paper? Cheap. Single-ply works OK for me and I don't have to change the roll as much! 4. 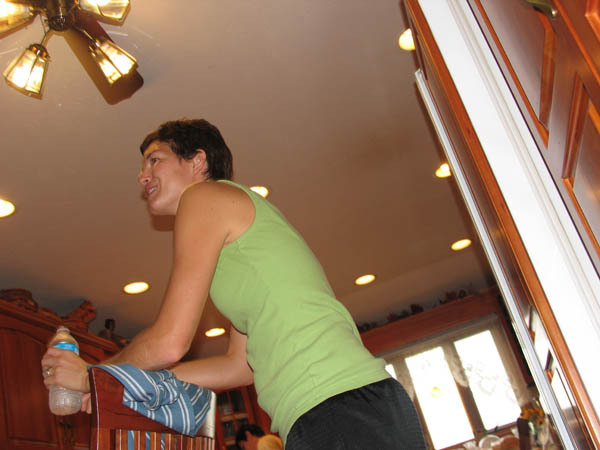 Have you ever had a surprise party thrown for you? Or have you had one for someone else? Never been thrown one. Pulled off a great surprise retirement party for my mom. Her surprise birthday party wasn't so much a surprise but we tried! 5. What is one material possession that you "can't live without"? My big red couch. It's my dinner table, my computer desk, my favorite napping spot. That was fun! Go to My Little Life to play along. Leave me a comment if you do and I'll come over to learn more about you. I'm not really going anywhere, but the pictures below got me started singing that song so I thought I'd just use it as my blog post title! 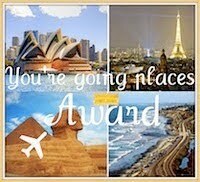 A big thank you and shout out to Little Miss Can’t Be Wrong over at how i met your father (still my all-time favorite blog name) for the "You're Going Places" Award. The rules are you have to state where you'd like to be in 10 Years. And then, from there, you tag 10 Blogger Friends to pass it on to! A woman of leisure traveling the world. OK, that’s probably NOT going to happen. So, I’d just like to be happy and surrounded by those I love whether family or friends. I’m going to copy Little Miss and give the award to some new bloggers who are going doing a great job and to some established bloggers that I aspire to emulate. Little D/Big D at Who is the grown up? Disclaimer: This post probably falls into the category of over-sharing but I feel that it’s necessary to share my experience even if it’s just for the amusement of my friends in the blogosphere! I should not be admitting this but it had been years – and I mean YEARS – since I had been to the doctor for a wellness exam. I’m a healthy person overall with an occasional cold or flu but never serious enough to warrant a visit to the doctor. Well, there was that one time about 10 years ago that involved the emergency room, a newlywed bride and immaculate conception…but that’s a whole other blog post! After about a year of hearing me complain that I couldn’t hear out of my left ear, a concerned fed-up coworker emailed me her doctor’s contact information, marched into my office and sat there until I made an appointment. Today was the big day…my doctor’s appointment. You are totally right and I do NOT advise any woman over the age of 18 (maybe younger) to avoid the doctor and these procedures. But in my defense, I am healthy and I’m not making my way through the bars of my little ‘Ville (if you get my meaning) so I figured I was OK! I was a bit worked up and worried before heading into the doctor’s office. I had also downed glass after glass of water throughout the morning so I’d be ready for that first little action that had to be done at my appointment. Don’t understand? 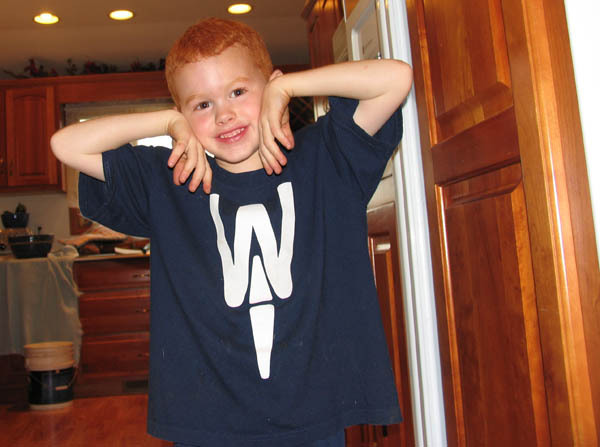 Let me spell it out. It involves me, a bathroom and a cup! So I was worried and anxious and little fidgety. The receptionist handed me a little plastic cup (picture the ones at the water cooler), a lid and a Ziploc bag and pointed me to the restroom. This was my first traumatic moment of the day. First, the bathroom was NOT in the office. It was down the hall, across from the elevator and a dermatology office. Second, there was no “fill line” on the cup. I had never done this before. How full should it be filled? This is when the first text of the day went out to my gal pals – Going Jane and Bathtub Mama. I needed support because I was traumatized. Thank goodness for friends! They both texted back right away and made me feel better – still traumatized, but better. I took care of business, walked casually back to the office – as casually as one carrying a “specimen” can walk – and sat down to wait for the doctor. The second text of the day went out about now. I was ready to bolt, but my friends came through yet again and calmed me down. An hour later I was taken back; weighed (gotta love that); and put in a room to wait again. That’s when the second traumatic moment of the day occurred. They should NOT leave patients waiting in a room for more than 30 minutes with a tray of strange looking tools and rubber gloves. God, you are killing me today!! Lol!! Glad I made someone laugh. I sure wasn't. I was traumatized, remember? The doctor finally came in. We had a nice chat and then the third traumatizing moment of my day occurred. I had to strip down, put on a paper vest (yes, vest - not a gown) and sit on a paper covered examination table and wait once again. I knew that the window was tinted and while I could see out, no one could see in, but I still moved to the corner of the room to change! At least they gave me a paper sheet to use as a blanket. I won’t go into the details of what happened when the doctor came back in. Let’s just just call it the fourth traumatizing moment of my day. No elaboration necessary, right girls? In the end, it was all OK. I survived and I now know what the plastic thing is for! I am a bit traumatized, just a bit traumatized, but now I have a remedy for my ear (hopefully); orders to keep a “headache diary” and a tetanus shot that is good for the next 10 years. I also won’t wait another 15 years before my next wellness exam, I think. After the picking and shucking is done (actually while the shucking is being done), the action moves inside. The ears are washed, whisking away as many of the remaining silks as humanly possible and then placed into boiling water to be blanched. Blanched, isn't that a strange word? I think I used it correctly here. If I didn't, someone please let me know! After a few minutes on the stove, the ears take a cool bath. Then it's on to the cutting board. 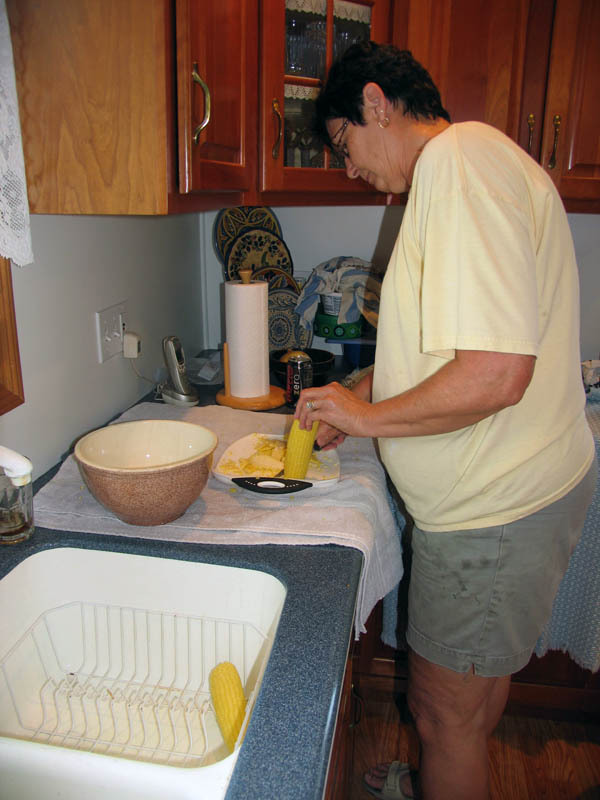 Throughout my childhood, my mom used an electric knife to quickly remove the kernels from the cob. I was going to do a whole blog post about why we use an electric knife because of the quantity of corn we put up. OK, I didn't get a good shot of the puny - oh so not electric knife - in mom's hand. After a few dozen ears done the old-fashioned way, my mom decided to go back to the electric knife because her hand was cramping. Unfortunately, the electric knife was no where to be found. We looked high and low; in cabinets and in drawers, but no electric knife. So, it was back to the little knife to finish up. Once off the cob, it went into one of my mom's beautiful bowls. She has a weakness for beautiful crockery. I'm afraid I may have inherited the weakness. Fortunately I don't get to very many auctions, antique shops and estate sales so I'm safe for now. Back to the corn...doesn't it look delicious! Once there's enough in the bowl, it goes into quart-size freezer bags. Lil' Sister did the honors. We don't get precise when it comes to measuring how much goes into each bag. And a bucket (or two) of empty cobs ready for a return trip to the field. 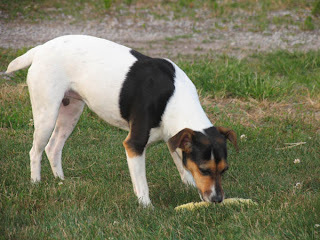 We are not the only ones who enjoy corn on the cob. I found Molly enjoying an ear at the end of the evening. Since our inaugural freeze fest, we've put up another 17 bags of corn and it's really just hitting its peak sweetness now. I think there may be some more freezing ahead of me. 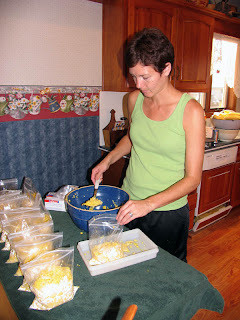 That wraps up my series on INCREDIBLE Sweet Corn. Hope you enjoyed! 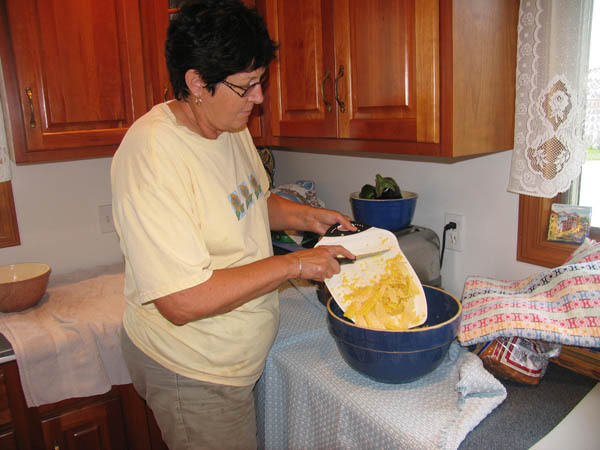 There are several jobs involved in freezing corn. The first is the picker who gathers the corn from the field. Is there a better name for that job? Picker sounds funny. The second job is the shucker. His mom and dad were a bit faster, but that's only because they've had years of practice! When shucking, it's important to remove as many of the silks (those silky strands clinging to the ear) as possible. That's a beautiful ear of corn! So you may be asking, "What happens to all of the shucks?" This year we used the standard "little red wagon" that every farm family has to collect all of the shucks and move them to the field. This is much easier than cramming the shucks back into those hand 5-gallon buckets and carrying them away! 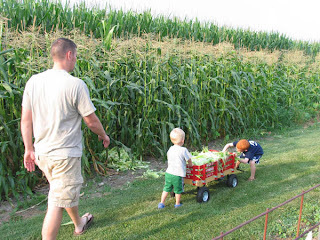 The nephews (with adult supervision) pulled the wagon full of shucks back to the cornfield for emptying(recycling/composting at the most basic level). After all of the hard work, a well-deserved ride home! Heading into the kitchen next...stay tuned. 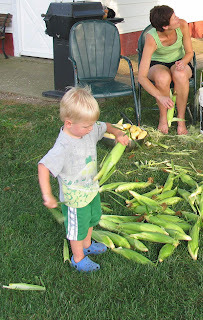 Last week my family gathered at the farm to freeze the first sweet corn of the season. 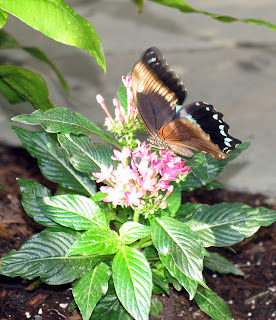 I took way too many photos (check out my Wordless Wednesday post from last week) and am having trouble editing them to just one post. So, I've decided to stretch it out into several posts over the week. It all starts with the corn! A co-worker asked me what variety of sweet corn my dad planted this year and she rattled off three or four varieties. After seeing the blank look on my face, she shook her head and said "Never mind." Truth be told, I hadn't seen an actual ear of corn off the stalk yet and hadn't asked what variety of sweet corn Dad planted this year. I just knew it was sweet corn and it was going to be GOOD! Once on the farm with camera in hand, I went out to the field with Dad and asked what variety we were he was picking. I found out it was Incredible, a yellow corn. After a quick search on Purdue's web site, I found out that Incredible is a sugar-enhanced variety. According to the web site, "Sugar-enhanced (se) sweet corn has a higher sugar content and is more tender than standard sweet corn." From the photo above, you may be wondering why the corn in front is shorter than the corn in the background. The reason is that the corn in the front is sweet corn and the corn in the back is field corn (or dent corn) which stays in the field until it's dried down in the fall and is used for livestock feed and processing (starch, alcohol and sugars). Unlike most folks who plant a few rows of sweet corn in their gardens by hand, my dad uses a bit bigger piece of equipment - like a 12-row planter pulled by a very big tractor! 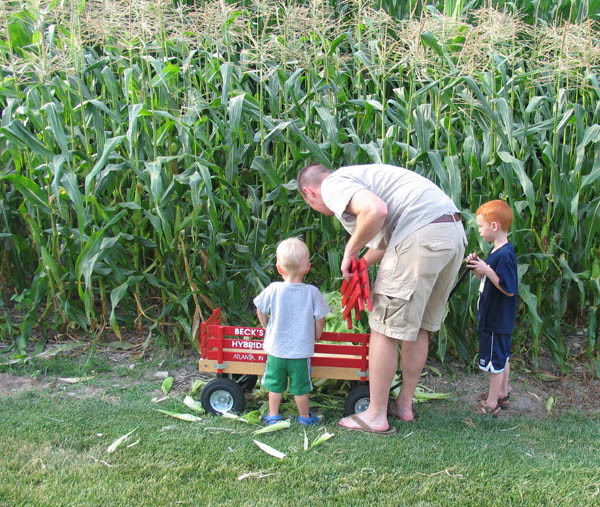 This year, he planted five rows of sweet corn along the two short sides of the field closest to the house. He also has patches in a couple of other fields planted a bit later so we can enjoy sweet corn throughout the summer. So, how does you know when the sweet corn is ready? Dad said that he looks at the size of the ears and squeezes the ear to see if it's firm. He also admitted that he "spot shucks" a couple of ears right on the stalk to make sure it looks ready to go! This year the ears were slightly smaller than normal - probably because of the tremendous amount of rain we got early in the season and the lack of rain we've gotten in the last several weeks. Note the 5-gallon bucket in his hand below. These buckets are staples around our farm. 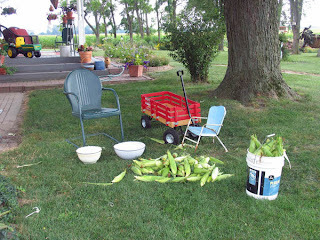 In my lifetime, I've seen them used for everything from gathering sweet corn from the field to transporting baby pigs. They are an essential tool on the farm! 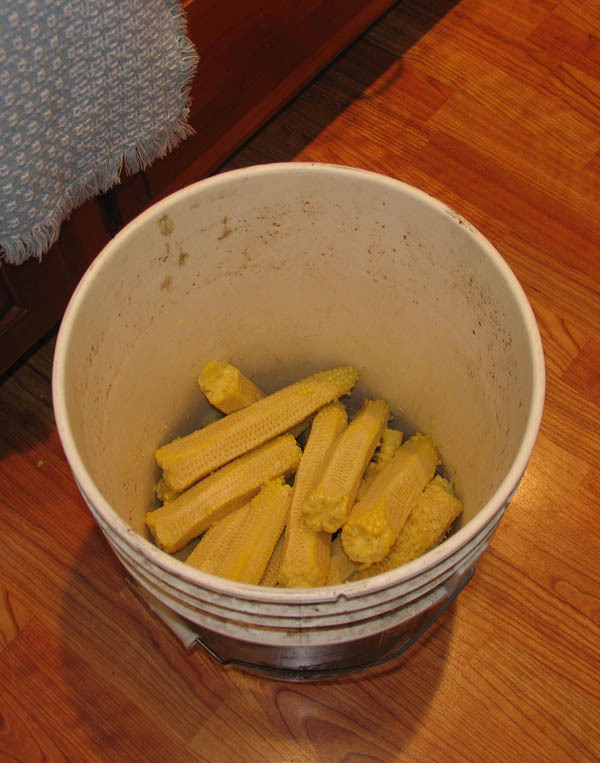 Dad picked six buckets of corn for our first evening of freezing. Tomorrow, the shucking begins! Stay tuned. Almost a month ago I started sprucing up my small outdoor space. Well, it's been a slow process between the rain, my work schedule and, honestly, my laziness! Recently, I recruited some slave labor help from my eldest nephew (see him enjoying the Dumbo ride during our recent trip to Disney World) to finish up the project. First we tackled the two large pots flanking my front door. Above is my first attempt at filling them - I'm usually very afraid of mixing colors. As you can see I stuck with white and purple at the beginning. He informed me that he can dig some great holes because of all of his time in the sandbox! I agreed and grabbed a broom. We also had to tackle spreading some mulch. It was getting hot so we did one side of the patio that morning and I finished up the other side a few days later. One trick that my mom taught me is a clever way to control weeds using newspaper! It's such great advice that I recently saw an article in the Indianapolis Star telling folks about it. If you have large sections of your landscaping that you don't plan on planting and you want to keep the weeds away, layer newspaper on the bare ground, wet them down and then place your mulch on top! I know it's nothing like the landscaping at the folks' farm that I featured at the start of this project, but I'm proud of it and hopefully I can add to it over time.